Implementing a batch process to handle gigabytes of data is a veritable tsunami of a task, but you can take it down a chunk with the help of Spring Batch. This popular Spring module has been engineered to handle the details of batch processing for all sorts of files. Get started with Spring Batch by building a simple job that imports products from a CSV file into a MySQL database, then explore the module's batch processing capabilities with a single or multiple processors and one or more helpful tasklets. Finally, get a quick overview of Spring Batch's resiliency tools for skipping records, retrying records, and restarting batch jobs. If you've ever had to implement a batch process to pass hundreds of thousands of data elements between Java enterprise systems, then you know what a load of work that is. Your batch processing system needs to be able to handle huge amounts of data, handle the failure of individual records without crashing the entire process, and manage interruptions and restarts without having to re-do what's already been done. You receive a file that is missing some information, so you parse through the file, call a service to retrieve the missing information, and write the file out for another batch process to handle. When an error occurs in your environment, you write the failed message to your database. You have a process that looks for failed messages every 15 minutes and replays ones that you've identified as replayable. You have a workflow in that you expect other systems to call certain services, in addition to events received. If those other systems do not call your services then you automatically clean up your data after a couple days so that the business processes do not fail. You receive a file every day that contains employee updates and you need to create artifacts for new employees. You have services that can be used to customize orders. Every night you run a batch process that constructs manifest files and sends them to your fulfillment vendors. For example, you might open a data file in CSV format, perform some processing on the data in the file, and then write the data to a database. In Spring Batch, you would configure a reader to read one line of the file at a time and pass each line to your processor; the processor would collect and group the results into "chunks" and send those records to a writer, which would insert them into the database. You can see the cycle in Figure 1. Spring Batch simplifies batch processing greatly by providing implementations of readers for common input sources like CSV files, XML files, databases, JSON records contained in a file, and even JMS, as well as writers. It's also fairly simple to build custom readers and writers if you need to. To get started, let's look at the process to configure a file reader to read a CSV file, map its contents to an object, and insert the resulting objects into a database. Let's look at these components. First, Figure 2 shows a diagram of the relationship between them. Lines to skip: The linesToSkip property tells the file reader how many leading lines in the file to skip. Quite often CSV files will contain header information, such as column names, in the first line of a file, so in this example we tell the file reader to skip the first line. lineTokenizer defines how to break the line up into tokens. In our case we list the names of the columns in the CSV file. fieldSetMapper builds an object from field values. In our case we build a Product object from the id, name, description, and quantity fields. Note that Spring Batch provides the infrastructure for us, but we're still responsible for the logic in the field set mapper. Listing 2 shows the source code for the Product object, which is the object we're building. The Product class is a simple POJO that wraps our four fields. Listing 2 shows the source code for the ProductFieldSetMapper class. 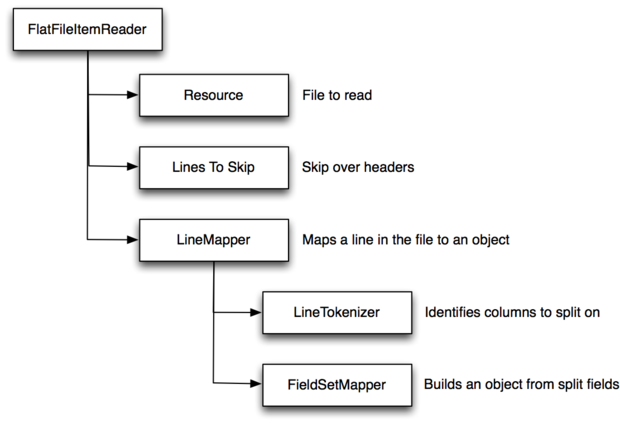 The ProductFieldSetMapper class extends FieldSetMapper, which defines a single method: mapFieldSet(). Once the line mapper has parsed the line into its individual fields, it builds a FieldSet, which contains the named fields, and passes that to the mapFieldSet() method. This method is responsible for building an object to represent that row in the CSV file. In our case, we build a Product instance by invoking the various read methods on the FieldSet. After we've read the the file and have a set of Products, the next step is to write it to the database. Technically we could wire in a processing step that does something to the data, but for now let's just write the data to the database. Listing 3 shows the source code for the ProductItemWriter class. It executes an SQL SELECT statement to retrieve the Product with the specified id. If the SELECT returns an item then write() performs an update to update the database record with the new values. If the SELECT does not return an item then write() performs an INSERT to add the product to the database. The ProductItemWriter class uses Spring's JdbcTemplate class, which is defined in the applicationContext.xml file below and automatically wired into the ProductItemWriter class. If you haven't used the JdbcTemplate class, it is an implementation of the Gang of Four template design pattern for interacting with databases behind a JDBC interface. The code should be pretty self-explanatory, but if you need more information, check out the Spring JdbcTemplate javadoc.